In a lot of ways, it felt like we had come full circle. Québec City was one of the first trips we ever took as a family of three. Those were the days when Trevor – at the ripe old age of nine months – took in the whole city via baby carrier. Chris and I loved that trip so much, we decided to return this year to cap off our 2018 year of travel. A lot has changed in the past couple of years. And, reassuringly, a lot has remained just the same. The drive from our home to Québec City is a little more than six hours. I remember being terrified to attempt this road trip with a baby, but Tru actually slept for a large portion of the drive up to Canada. When he woke up though, he was not happy. Fast forward to two-and-a-half-year-old Tru, who’s now a seasoned pro at travel. He sat, without complaint, for the entire drive. I was thrilled that I didn’t have to climb into the back seat at all! He kept entertained mostly with children’s music cds, plus some snacks along the way (milk, pretzels, and peanut butter crackers). He took a short nap after lunch for about 20 minutes this time around. I think what kept him so content was that we made a stop at the halfway point that was just for him: his absolute favorite restaurant, McDonald’s. It was bitterly cold outside, but he was able to run off energy at the indoor playground and enjoy his favorite meal (a Chicken McNuggets Happy Meal). We found that the whole stop-for-an-indoor-playground-break worked so well, we did the exact same thing on the return trip. We loved the hotel we stayed at for our first trip to Québec City, Auberge Saint-Antoine. So we booked the same hotel again. I can very clearly remember Chris and I struggling to get ourselves – plus our baby and all of his stuff – into the lobby. Chris struggling with a heavy suitcase overflowing with bottles and wipes and diapers … plus a pack n’ play … plus a stroller … plus a baby carrier. And me struggling with a squirmy baby and a nursing pillow around my neck. We were so overwhelmed by the packing, we forgot winter boots … in Québec …. in December. The hotel had booked us the exact same room as our first stay! This worked just fine for me because I loved that room. It was welcoming and cozy. and the most beautiful bathroom. …this time, he darted around the room and jumped up and down on the bed. It was a challenge to keep a baby entertained in a hotel room back then. It’s ten times more of a challenge now. During our first trip to Québec City, Trevor cried plenty. So he definitely voiced his opinion. However, he didn’t talk, didn’t walk or run or dart away from us, and didn’t argue with our decisions. During our most recent trip to Québec City, he did all of the above! Trevor loved this huge, sprawling park called the Plains of Abraham. I think our visit here was his favorite part of the trip. We had gone to brunch at CIEL! Bistro-Bar, which is a restaurant offering incredible views of Québec City. When we got outside, Tru saw this park and went running for it like it was his long-lost best friend. We haven’t had much snow at home this year, and he couldn’t wait to start playing! It was a beautiful park, with trails and hills that seemed to stretch for miles. He started sobbing when we had to leave. I think one of the things I love so much about visiting a new destination is that I have absolutely no expectations. Everything is new, which leaves plenty of room for wonderful surprises. For example, I loved wandering the German Christmas Market when Trevor was a baby. He sat happy and wide-eyed in his baby carrier while we wandered the storefronts. A gentle snow was falling all around us, the air was filled with bell chimes from Notre-Dame cathedral (across the street), and I even found a little Christmas village display to buy as a souvenir of our trip. This year, we arrived at the German Christmas Market after a long evening of exploring the city by foot. Tru was growing tired and fussy. And the throngs of tourists at the market were really heavy – we could barely make our way through the crowds. … And the German Christmas Market was closed. Our timing was so right the first time around and just so wrong the second. Old Québec, though, was as festively decorated and stunningly beautiful as I remembered. We had so much fun checking out the Aquarium du Québec on our first trip to Quebec City. This time, it was even better. Because Trevor could tell us everything he was thinking and experiencing! I remember visiting the Musée National des Beaux-Arts du Québec when Tru was a baby. Chris and I were able to wander the exhibits at our own ideal pace, go our own way. Things weren’t so simple this time around! Tru has visited several museums at this point, so he’s pretty well-behaved. But he likes to move at a rapid pace. Nothing holds his attention for very long. What Tru did love, though, were all of the hands-on exhibits. When Tru was a baby, I dressed him up in his best Christmas outfit and we took him to meet Santa (known as Père Noël in Québec) at the Quartier Petit Champlain. I was completely blown away by the gorgeous outdoor Christmas village setting where Santa sat on a carved wooden red throne. Unfortunately, it was cold and snowing that evening. So Tru’s outfit was covered by a snow suit, mittens, and hat. And the second I placed him in Santa’s lap, he started sobbing. So I got one blurry picture of Tru screaming. Over the past month, Tru has been fascinated with Christmas books and Santa. He knows Santa will visit his house on Christmas, and he knows what we wants: a yellow dump truck. The kindest and most authentic-looking Santa, perched at a desk covered in Christmas decorations, with a notebook and quill pen in hand. This time around, Tru was fearless and bold! As we wandered down the beautiful Quartier Petit Champlain, Santa was back in the same outdoor Christmas village display as the one we’d found when Tru was a baby! This Santa looked as authentic as any I’d ever seen but, for some reason, Tru’s fear returned. He wouldn’t go near Santa. But this beautifully dressed Santa was a seasoned pro with a plan! He instructed Chris (who was holding Trevor) to stand a few feet in front of him. He told me to get ready with the camera. Then, very calmly and slowly, he approached Trevor. 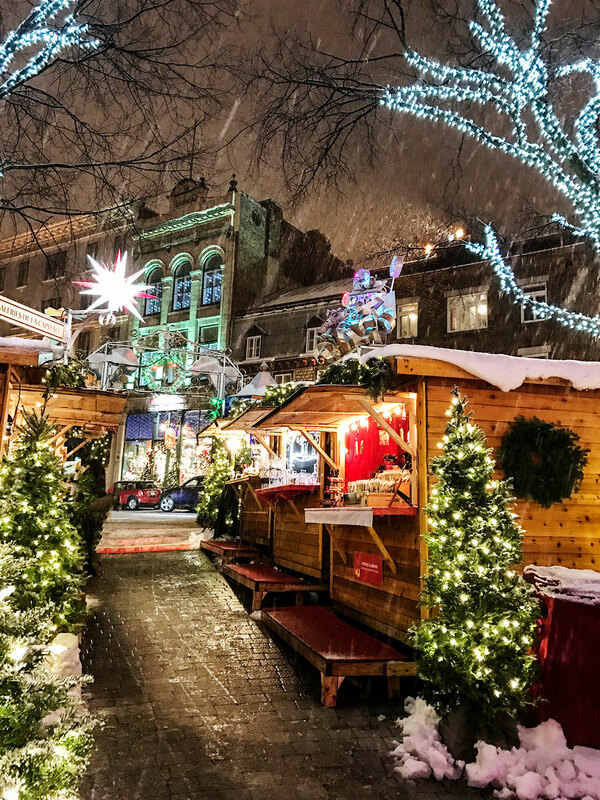 Québec City is truly a fantasy storybook Christmas village made real. I’ve loved both of our holiday trips to Québec and hope we’ll continue to make it a family tradition! Oh my goodness.. I’m so happy I stumbled upon your post today. I’m traveling to Quebec in the summer. Please any more tips & must see tourist spots would be so greatly appreciated. It looks so beautiful. I can’t wait to go.